Our local conservation group - the Coleorton and New Lount Volunteer Group - hold occasional "Table-top sales" to raise funds to help with their work. 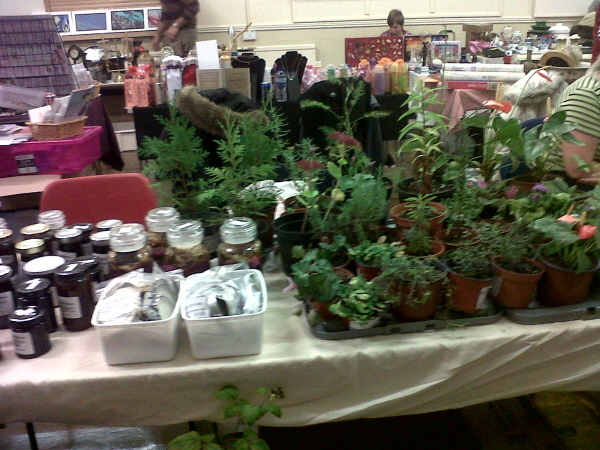 So this Saturday I had a table and stocked it up with garden and house plants, home-made jam, marmalade and chutneys and some rose-petal potpourris. It's as much a social event as a money-making exercise but it's a fun way to contribute to the volunteer work. I had already potted up some suitable plants for sale including pots of thyme which I grew from seed last year and are now maturing nicely, but I wanted a bit more colour. 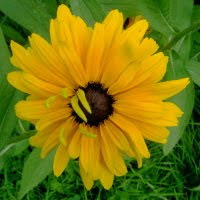 It's difficult to find garden plants in flower at the moment. 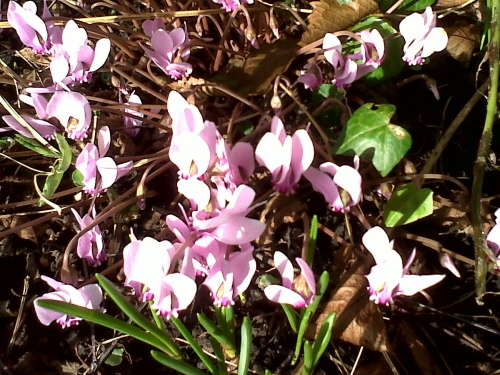 There are still some little cyclamen in bloom in the bank under the cherry tree. I had to work hard to dig up a patch, and thought I must have been tugging at cherry-tree roots. But when I got the clump into the greenhouse to separate into pots I found I had dug up an enormous corm about 20cms in diameter and 7 cm thick which was supporting a number of smaller corms. I'd never seen one so big and I'm wondering what's under the soil in the front garden which is carpeted with pick and white cyclamen. Pretty pink cyclamen emerge each Autumn from corms - some of which can be enormous.